A trip to the Pacific's beacon for big animals and action. Join us and Okeanos Aggressor I to one of the top dive destinations in the world, featuring whale sharks, schooling hammerheads, white-tips, tuna, manta rays, turtles and giant frogfish. 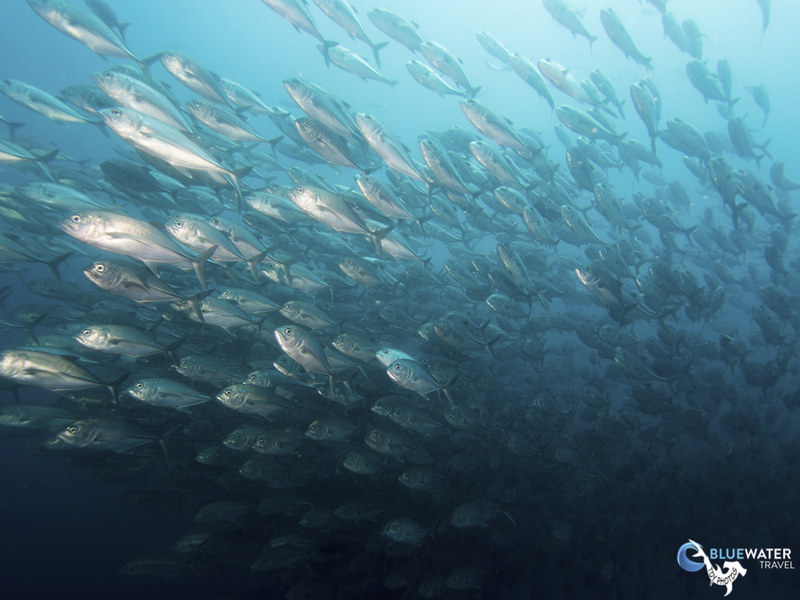 With occasional dolphins, sailfish, eagle rays, false killer whales, the list never ends! Trip led by Mark Strickland. EARLY BIRD SPECIAL: $1,200 OFF! 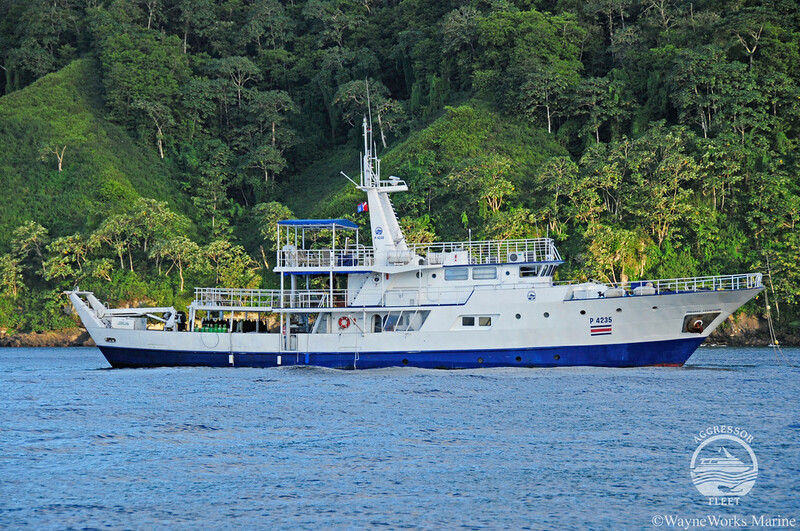 Escape to Cocos Island on a liveaboard scuba diving trip in Costa Rica! 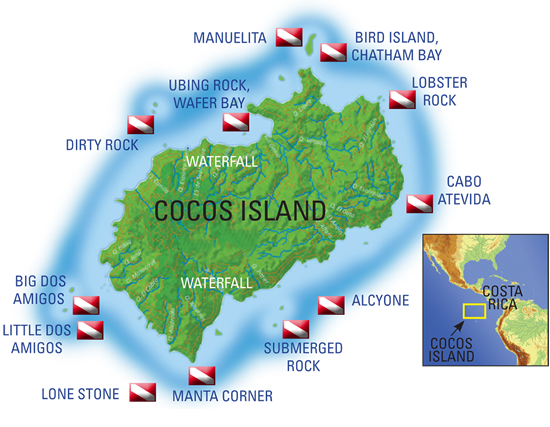 Cocos is a lush, green uninhabited island resting 342 miles off Costa Rica's Pacific coast. 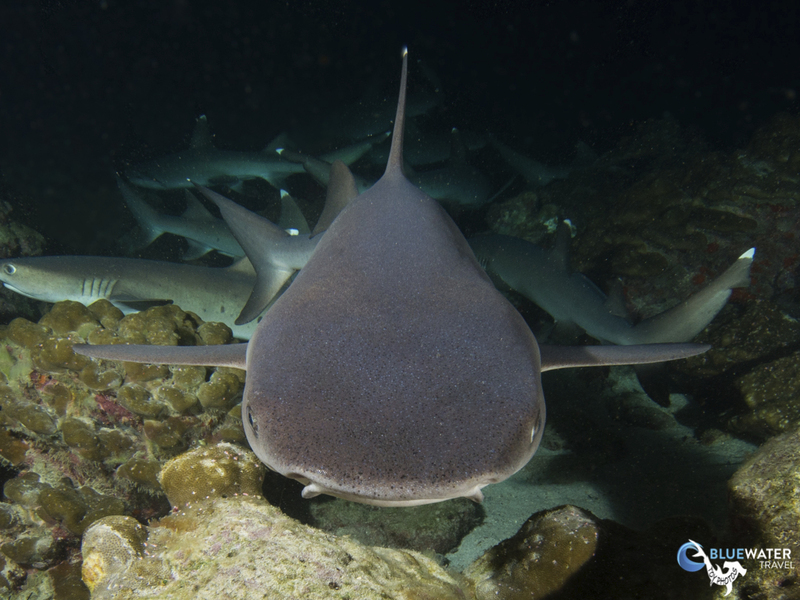 Rocky pinnacles surrounding Cocos are beacons for big animals and big action. 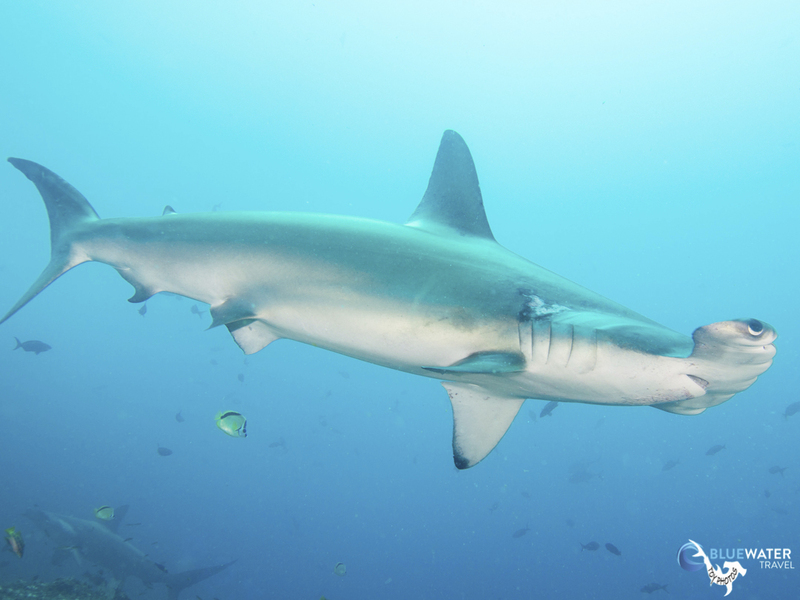 Schooling hammerheads, countless white-tip sharks, mantas, tuna, and even whale sharks call Cocos home. 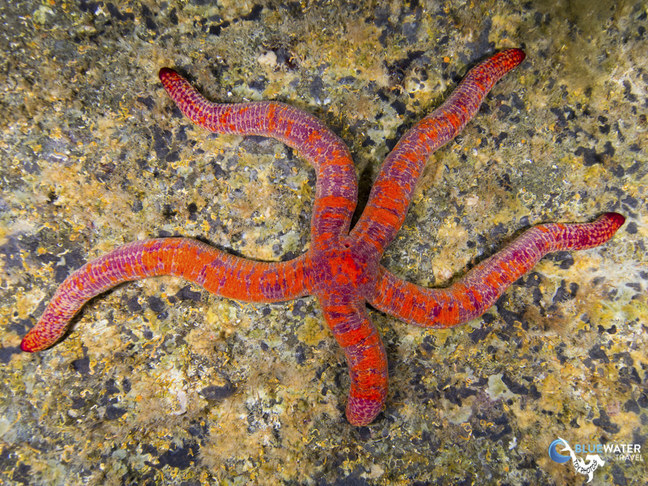 The ten-day trip offers seven days of Costa Rica liveaboard scuba diving. To get a little insight as to what the trip is like, read the reports from our previous trips here and here. You'll be diving in water temperatures between 72-82 degrees. Alcyone - A 600’ long submerged mountain, the top of the mountain is 75’ from the surface. Schooling Hammerheads, Mantas and schooling fish. Possible Sailfish or Marlin. Big Dos Amigos - This islet features a 45-foot-high arch and 60-foot pinnacle off the southeast side. Look for Rainbow Runners, Yellowtail Snapper, Bigeye Jacks and lobster. 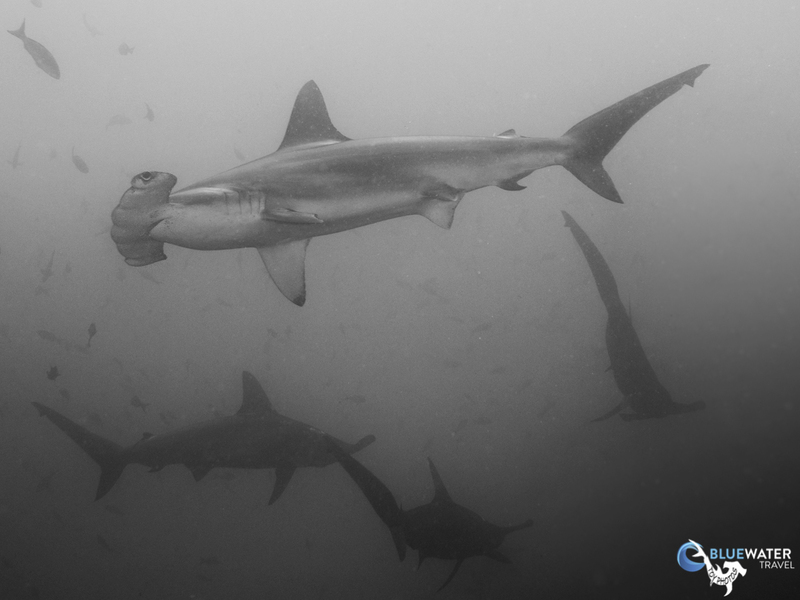 Hammerheads swim between the pinnacle and arch. Bird Island, Chatham Bay - Dove from Chatham Bay, southeast of Manuelita, this site provides a variety of marine life including Frog Fish, lobsters, morays, rays, White Tip Sharks and Hammerheads. There is even a cleaning station. 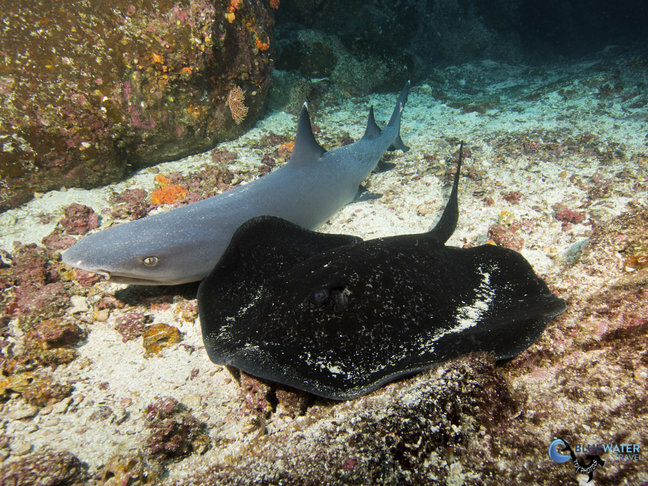 Dirty Rock - A large island with schools of Marble Rays and Hammerheads. /Lone Stone - Schooling Marble Rays and Mobula Rays. Manuelita - The northeast corner has a sheer wall. Lots of White Tips, Marble Rays, and schools of Creoles. 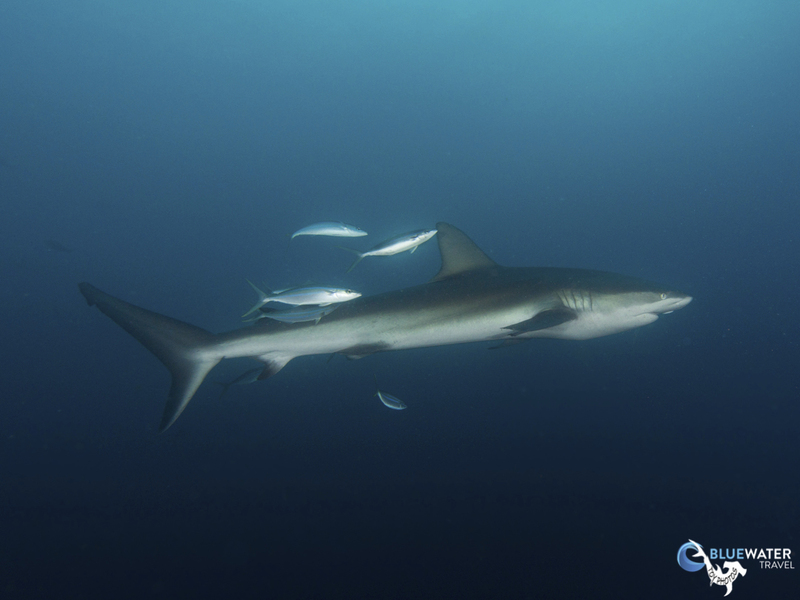 Special Sightings - Whale Sharks, mating Eagle Rays, Sail Fish, mating White Tip Sharks, False Killer Whales. Ubing Rock, Wafer Bay - This 300’ rock begins at 20’ and drops to a 110’ sandy bottom. 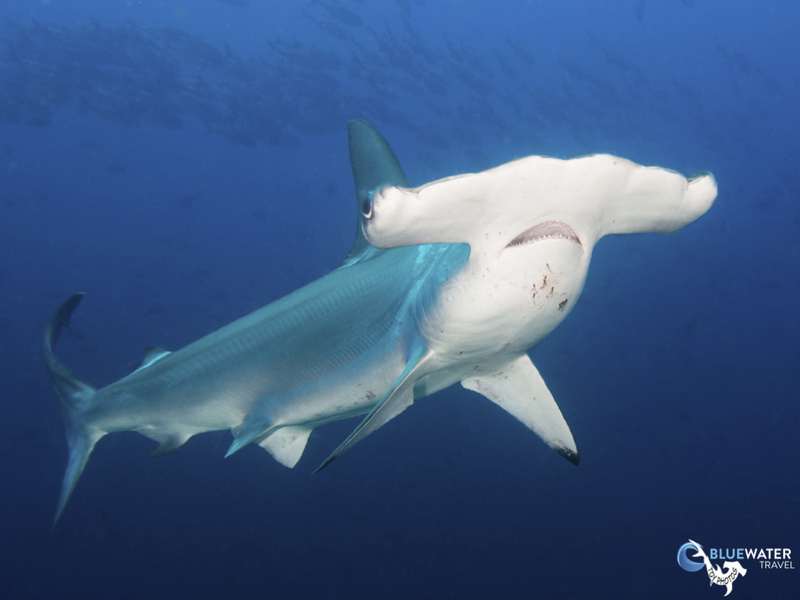 The southeast slope attracts schooling Hammerheads. Day 1 - Meet in front of host hotel. Transfer to Puntarenas for boarding and departure for Cocos Island. 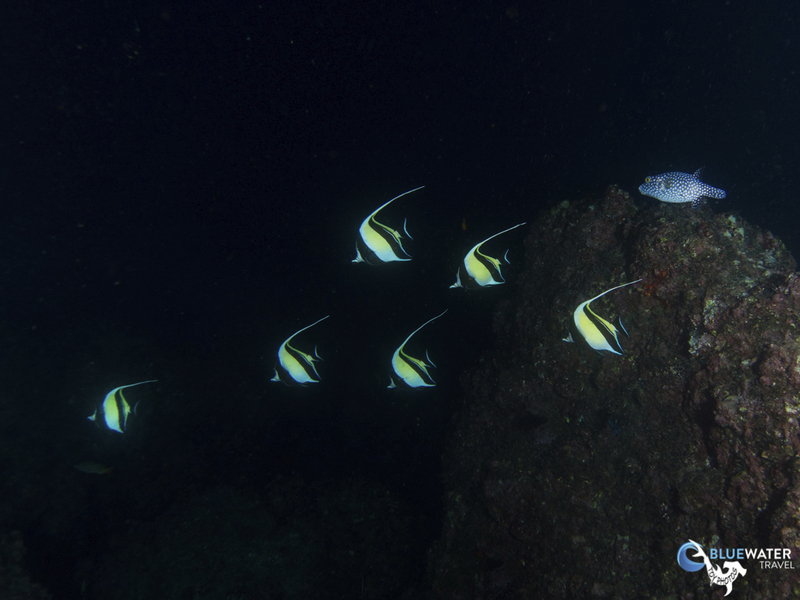 Day 2 - 3 - Arrive at Cocos Island, diving begins. Day 4 - 9 - Eat, Sleep & Dive. Day 9 -10 - Travel back to Puntarenas. 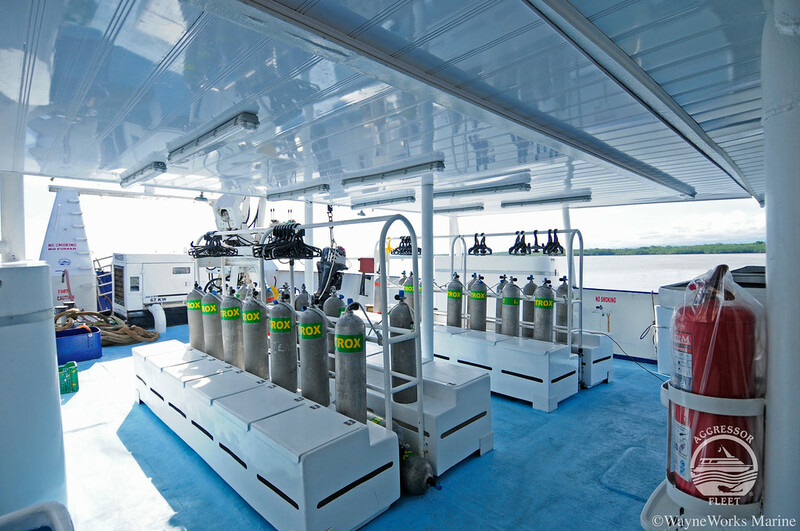 The Okeanos Aggressor I is a 110-foot yacht with a spacious dive deck. 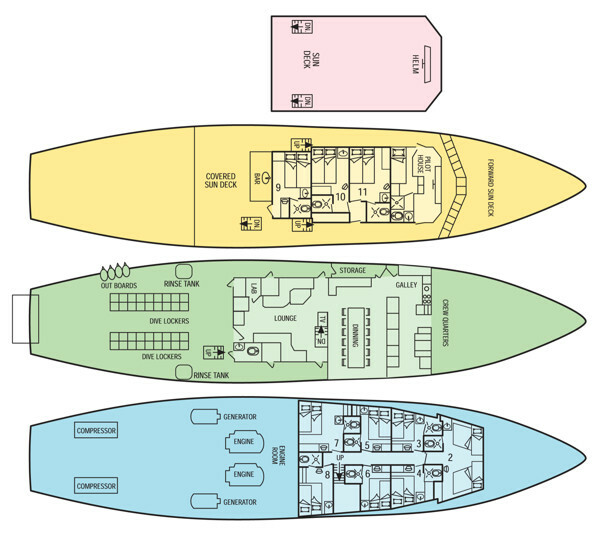 Comfortable accommodations for 22 guests include 9 double cabins and a quad cabin. Each cabin features a private head and shower, and storage space for your luggage. 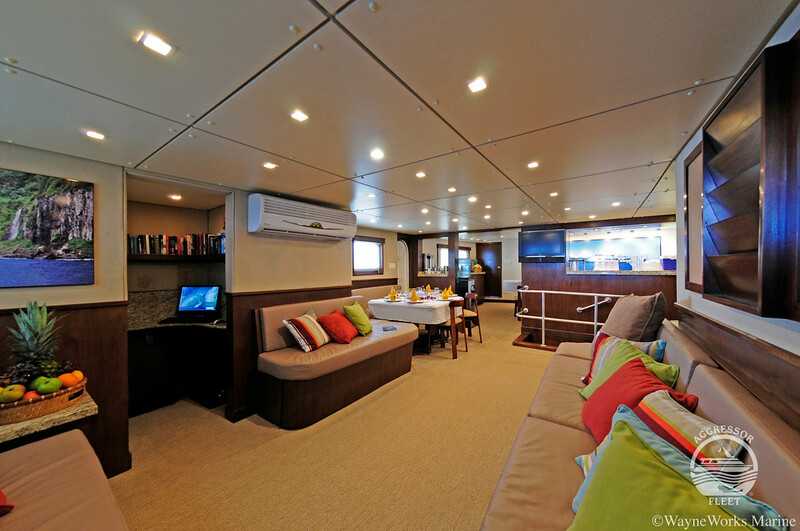 The Okeanos Aggressor has a spacious salon, 40 feet of sun deck, chaise lounges, deck chairs, bar, grill, and a complete photo center. Most major airlines fly into San Jose, Costa Rica: American, Iberia, United, Delta, Lacsa, Taca. An overnight stay in San Jose is usually required prior to the trip due to airline schedules. Recommended hotels are the host hotels, Holiday Inn Escazu and Holiday Inn Express Forum (formerly Indigo Hotel) in San Jose where group transfers are provided from. After a full seven days of diving, the Okeanos Aggressor I returns back to the dock in Puntarenas, Costa Rica. Check-out is Tuesday morning at 7:30 am. Transportation is provided back to the host hotels or San Jose (SJO) airport from the yacht at the end of the charter. Book flights after 12:30 pm. Mark Strickland’s life-long interest in the sea has included over 10,000 dives and careers as a lifeguard, boat captain, and scuba instructor. His passion for underwater photography has led him to many top dive locales, including the Virgin Islands, Australia, and Thailand, where he spent 17 years as Cruise Director on a series of liveaboards. Mark now resides in Ventura County, California. Currently, Mark leads several dive trips each year to his favorite destinations, while working on a career-spanning large-format pictorial book. Learn more about Mark here. "Mark was patient, knowledgeable, organized, and friendly. He had a concern for all of us--travel-wise and photography-wise. He was one of the best." and "Mark and Adam made me a tremendous fan of Blue Water Travel and will absolutely guarantee that I will book another trip with them again. You guys more than rock." - Dr. Ray T.